I regularly walk down to the water to collect a few rocks. 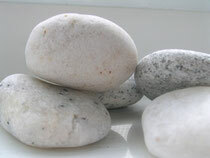 I often keep these rocks in full view by a windowsill or in my car or desk at work so, I don't lose track of them. These are gratitude rocks. When I see them I am reminded of just how grateful I am. During times of stress and challenges in life I turn to these rocks more frequently. I would especially like to express my gratitude to all those who supported me on my journey to become a Reiki Master. I finally achieved this last weekend and am excited about this new development. I also would like to thank all of my family members and friends who let me practice reiki on them!